Roberts Revival Cath Kidston review | What Hi-Fi? 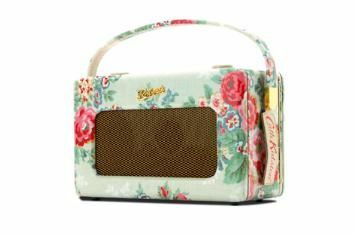 Queen of kitsch, Cath Kidston, has turned out a flower-power version of Roberts' retro Revival radio. It's not her first dalliance with tech-design; previous conquests include floral Sky boxes and mobile phone cases and, as with this radio, it's fair to say the design won't be for everyone. Beauty is in the eye of the beholder, so we'll stick to what we know best and tell you the radio itself is none too shabby, though at £200 a little on the expensive side. While the overall design feels solidly built, placing the controls and display on the top of the radio won't suit everyone. The buttons could feel more inspiring, too. You'll find a USB input for firmware upgrades, plus a line out and an auxiliary input on the top of the radio. It can be mains or battery-powered too, and there's a headphone connection. Nevertheless, the familiar, almost comforting sound of a Roberts radio soon comes to the fore. Listening to BBC 6 Music, there's warmth and solidity to bass notes, detail to midrange and a smooth, refined treble. Switch to talkSPORT for some, well, talking, and, though you'll find dialogue could be a little clearer at times, the Revival's sound gives a certain gravitas and authority, with plenty of bottom-end weight permeating across the tonal range. It's more of a designer radio than most here thanks to Cath Kidston's input, but this Roberts is also a rather fine-sounding, if a touch expensive, digital radio.